Images shot on the Isle of Skye, Scotland UK. August 1988. Pentax 645 55mm and 150mm lenses. Contax 139 35mm and 135mm Zeiss lenses. Kodachrome 24, 64 and Fujichrome 50 and 100. Stock photography is a long term commitment and if you get it right images can generate an income long after they were created. The above images were shot over 28 years on a trip to the incredibly scenic Isle of Skye in the north west of Scotland. They still generate sales today and in fact it's very rare if I don't sell 2 or 3 of these images every week. And I see no reason why that shouldn't continue. Because there is nothing really to date them. This is a landscape that changes over millennia, not a few years and I was very careful to make sure that anything that might look out of place and time was eliminated from the composition. As indicated above these were shot on 35mm and 6 x 4.5 MF cameras and transparency (slide) film. Obviously I scanned them some time ago and they have been for sale on this and other websites for a number of years. As I indicated in a previous post, film plus processing isn't cheap and I always worked on an estimate of £1500 for a couple of weeks intensive shooting. Now it takes a while to get that back and move into profit, as well as taking into account the cost of the camera, lenses, travel, accommodation and food. You'll not be surprised to learn that prior to digital, there weren't that many of us shooting stock full time. In those days you had to be prepared to invest in possible future earnings without really knowing if you were ever going to get your money back. But that did of course concentrate the mind. Much as I like to experiment, I had to make sure, shooting with film, that I got the 'money shot'. Fortunately the light on Skye is spectacular if fleeting. One of those 'four seasons in a day' places. There is also the colour saturation and rich punchy look of film which helps the images stand up all these years later. And often people misunderstand what it takes to get a stock photograph to sell. People obsess about dynamic range, colour accuracy and all the other preoccupations of the photographic internet, but for travel / scenic / landscape / location photography, good strong colours and slightly heightened contrast works well. What has to be remembered is that images like this are mostly used to 'sell' a tourist destination. Magazines, Newspapers and Travel websites need to have pictures that make a place look special and inviting. To make the viewer contemplate going there. Now that may seem obvious, but I'm often surprised at just how bland some peoples attempts at travel photography are. There is obviously a lot of competition these days. When I took these images and sent them off to various libraries I sold through, I knew that the market for images like this in the UK was served by only a few libraries and by not that many contributing photographers. These days there are stock libraries out there with 100 million images plus for sale on the websites. 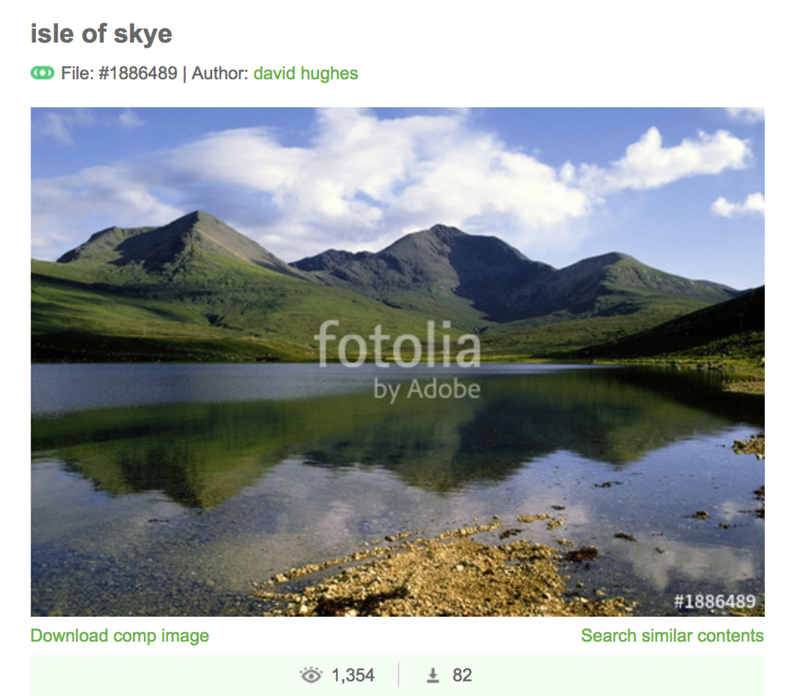 The library I linked to has well over 20,000 images of the Isle of Skye alone and that's just one library. Now when I was taking these photographs I doubt if all the stock image libraries in the UK could muster a quarter of that in total. So, there are a lot of images out there and that's why it's important to give your images the best chance possible. And that doesn't mean that you have to try and get spectacular images, often the simplest compositions, as long as they look inviting, are in demand. Of all the images shown above the one below has sold the most, 82 times on this particular library. It's a nice shot, with good reflections. But it's nothing special. Shot in mid-afternoon the light is OK but no more than that. There is room for text and the composition is symmetrical, so it has a lot of potential uses. There are shots in the series I like better, but haven't sold as many, but then I'm still pleased with it. So in the end, my investment has paid off and there are now very few of my long expensive film stock shooting trips that owe me money and they have been compensated for by some very profitable ones. Including this one to Skye which has paid for itself many times over. As you might have gathered by now the point of this post is to advocate the need for patience with stock photography and those who are used to (and can tolerate) deferred gratification will do well. Now I can't claim to be a particularly patient person, but doing this for a living I have to be. Because like everybody else, I create an image I'm really pleased with and upload it immediately expecting everybody else to feel the same. But of course nobody may even look at it for years or months. Finally, I've told this story before, but it's worth repeating here. The picture above shot in the French Pyrenees in 1991 with a Pentax 645 camera and 150mm lens was always one of my favourites. 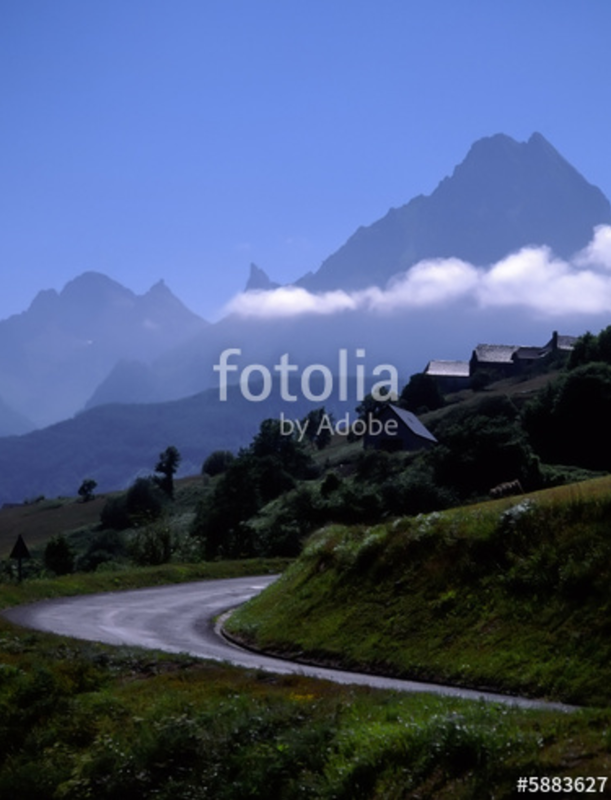 The road and the cloud hanging over the village with those amazing peaks behind. When I was submitting transparencies / slides to picture libraries this actually got rejected by all of them. Eventually I scanned it myself and submitted it to a library that pretty much took everything I sent them. A couple of years later it sold to an ad agency in the US (i actually never found out exactly what for) but my library informed me it was used in an advertising campaign, in magazines and on the sides of subway trains and buses. And for this my commission was just under £10,000. Now it is far and away my best selling image ever. After the license period finished, I have put it on several other libraries, but it has never sold again. Now I'm not saying that if you have the right picture you can make that kind of money, because the days of pictures being sold for that amount are long gone. (Unfortunately!!) These days you have to sell large quantities to make money from images. But it does go to show that stock photography can have long term rewards. It took 15 years for this image to reward it's creator and I still shoot pictures with that kind of longevity in mind. And I have many examples of that. So if you are contemplating having a go yourself you should be aware that very few photographers doing this become 'overnight sensations' but if you fancy shooting what you want, when you want and how you want and eventually end up making some money from it, then all I will say is give it a go. After all it's only time and money you have to give up.